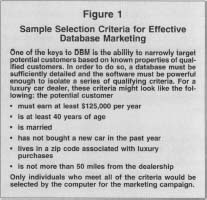 Database marketing (DBM) is the process of generating sales leads from a detailed computer database of existing or potential customers. When properly executed, DBM is a targeted and relatively inexpensive marketing technique. Essentially, DBM is customer-tailored marketing driven by information about the customer. While the customer is a very important component of any marketing approach, in DBM the customer, rather than the product or service one is trying to sell, is the focus. DBM is a form of direct marketing, but the two are not synonymous. It goes beyond the straightforward direct marketing approach of a regular mass mailing, which the customer often discards, or cold calling. Rather, DBM attempts to identify qualified potential customers by numerous demographic or statistical criteria and then market only to those individuals or businesses. Customer information must be sufficiently detailed in order for the marketer to make meaningful distinctions between those who are likely to be most receptive to the marketing and those who would be either unqualified (e.g., can't afford) or uninterested (e.g., no need). Conversely, the marketer doesn't need to be saddled with storing and updating extraneous data that do not serve any compelling business need. As this suggests, before the database is ever used, the marketer must also be adequately familiar with the market, based on in-house sales history data or outside market research, to know what demographics or other traits characterize good sales prospects. But detail alone can't save an error-ridden database. If mailing addresses or phone numbers are out of date, the information may be worthless. There are various tools a marketer might use to update the data, such as using change of address records, but otherwise out-of-date records can be dead weight that only cost the marketer money without any promise of returns. (This is not to suggest, however, that there is no value in maintaining historical data when it is understood as such; this sort of information can be extremely beneficial in predicting future behaviors.) Similarly, if the demographic and other information about potential customers is wrong—they really aren't in the right income bracket even though the database says they are—then DBM also fails because the marketer is, in essence, contacting people at random. The software and hardware on which the database is maintained can also impact DBM's effectiveness. In an age of fast, relatively inexpensive desktop computers and increasingly sophisticated software for them, this aspect is not as great of a concern as it might have been in the early 1990s or before. Most off-the-shelf database software can support moderately advanced data management and manipulation; it's harder to generalize about high-end and proprietary systems, but the best ones offer substantially more powerful resources—including data mining tools to help identify and understand meaningful patterns—than does ordinary retail software. The main systems issues are (1) having adequate data management tools in the software to finely comb through data and create marketing lists based on multiple narrow criteria, and (2) having enough processing power, particularly in the case of large lists, to run such database filters in a timely and efficient manner. Finding and maintaining such detailed and accurate data is the challenge in database marketing. There are two main ways, often used in combination. In-house data. Established customer records or other in-house market data is often the basis for starting DBM. Past customer information can provide valuable demographics for identifying new customers, as well as signaling existing customers who may be eligible for additional sales. This can be the most valuable marketing information of all, as it is based on actual purchases. Other in-house lists might include people who have inquired about products but never purchased, or others whom the company has marketed to in the past. Commercial vendors. Scores of list vendors provide marketing lists to businesses for a fee, but quality and usefulness of these vary widely. Traditional, bare-bones "mailing lists" containing only names and addresses aren't well suited for database marketing. However, when more detailed data on potential customers are available commercially, often the information is maintained more rigorously than a marketer can do on its own. Commercial vendors usually are also able to maintain such data at a lower cost to the marketer. Choosing which internal and external data to use, then, is of paramount importance in DBM. Typically, the cheapest route is not the best, because inexpensive or free data are unlikely to have undergone satisfactory maintenance. An effective database is updated regularly and bad information is weeded out. Some experts recommend that to be considered an effective investment, no more than 4 percent of a database should be out of date. This can be measured in the number of mailing pieces returned to the sender, the number of disconnected phone lines, and so forth. The more a company knows about a customer or likely customer, the better able it is to attract and hold on to that customer. The requirements for a successful DBM strategy are a nuanced understanding of the database, as well as a creative marketing person or staff who can generate and implement ideas that attract customers on a more personal basis than traditional mass marketing. Since DBM takes time to produce results, another requirement is long-range persistence and patience. Even when they have made a commitment to use DBM, businesses often struggle with defining the strategic rationale for doing so. Some attempt DBM simply because competitors have used it or because they have a general wish to increase sales. Such vague motivations can lead to a poorly conceived and executed DBM strategy. To fuel DBM initiatives, marketers should have specific objectives driven by market knowledge and business needs. These objectives should determine what kinds of data are collected and maintained (not too little and not too much), at what cost, and so forth. To preserve the strategic focus and relevance of the DBM initiative, some advise keeping project oversight closely controlled by the company's sales and marketing departments, rather than by other areas of the company. Many companies have been reluctant to invest in DBM because the payoff is not immediate and the requirements are demanding. Numerous studies confirm the fact, however, that the company which shies away from DBM will eventually lose customers to the competitor that does employ this strategy. This is especially true in businesses in which competition is most intense, such as in retail or in nonprofit organizations dependent on private donations. DBM, in which the right customer is targeted and remains a loyal customer, is the wave of the future. It is not without controversy. Often a great deal of personal information is required of the customer, and the issue of privacy is going to become more important as more organizations and businesses turn to this method of marketing. Data obtained by private industry and organizations is unregulated. Abuses of information have occurred. Surveys conducted in the early 1990s by private research firms such as Lou Harris indicated a strong aversion on a consumer's part to too great an invasion of privacy. Therefore, businesses should practice responsible DBM, as how a firm handles the information it gathers will increasingly determine its future success or failure using DBM strategy. One important new application of database marketing methods is on the Internet, where the data collection and marketing functions can interact in real time. Innovative marketers have begun collecting data on potential customers who view their web sites, and, moreover, customizing the online information or promotions for the particular person viewing the site based on this information. This is accomplished by uniquely identifying visitors—often actually their computers—when they first view the site. For the visitor, the process may involve taking a voluntary survey or registering to view restricted-access features on the site. Or, more simply, the site may be configured to merely place an identification "cookie" on the visitor's computer that can then be read in subsequent visits. Depending on what information is contained in the cookie and what the marketer's objectives are, the cookie may be used to track frequency of visits or other information. While this also raises privacy concerns, the promise of DBM on the Internet is the same as it is in all other forms: the more the marketer knows about its customers, the better it is able to generate new sales by delivering targeted and relevant marketing messages to individuals. Berry, Michael J.A., and Gordon Linoff. Data Mining Techniques: For Marketing, Sales, and Customer Support. New York: John Wiley & Sons, 1997. Carey, Michael. "Marketing Databases: So Near and Yet So Far.' Direct Marketing, November 1998. Hughes, Arthur M. The Complete Database Marketer. Chicago: Irwin Professional, 1996. ——. Strategic Database Marketing. Chicago: Probus Publishing Company, 1994. McLaughlin, Rachel. "The Five Data Pitfalls." Target Marketing, October 1998. Schmid, Jack, and Alan Weber. Desktop Database Marketing. Lincolnwood, IL: NTC Business Books, 1998. Spector, Jerry. 'Strategic Marketing & the Prisoner's Dilemma." Direct Marketing, February 1997.